Is primarily lilac (even though it looks light blue in the pictures) with very light gray color blocks across the upper chest and front and back on the sleeves. Has darker purple-blue piping curved down the front and on the front of the sleeves delineating the lilac from the very light gray field. This jacket is in very good condition. COLUMBIA WOMAN'S AURORA'S WAKE II OMNI-SHIELD RAIN JACKET. Front slash pockets. STYLE: Hooded Rain Jacket. Omni-Shield® advanced repellency resists light rain and stains. COLOR: HAUTE PINK FLOWER EMBOSS. 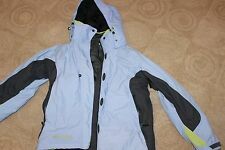 Columbia Titanium multi-layer ski coat size Large. Removable inner layer in the color of black. Outer color is more of a sky blue with lime green trim. Also has a detachable hood. Size Large L. Pink. Double required # for more accurate sizing. Armpits: 28. What you see is what you buy. 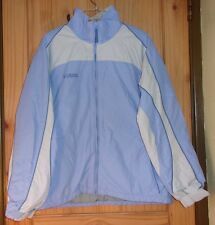 Women's large powder blue Columbia dress jacket. Condition is Pre-owned. Shipped with USPS Priority Mail. This comes from a smoke free pet free household. I also live in the USA for faster easier shipping. The length is 29.5 inches. Pit to pit is 23 inches. DRAW STRING IN HEM OF JACKET. COLUMBIA SPORTSWEAR CO. ELASTIC AROUND CUFFS. DETACHABLE SLEEVES. Womens columbia Nylon Hooded sleeveless Vest women’s Size Large Slightly Used Condition is Pre-owned. Shipped with USPS Priority Mail. Omni-Tech waterproof. Interior security pocket. Drawcord adjustable waist. Bust/Chest: 28". Sleeve: 22". Size: Large - L. Closure: Zip Front. Waist: 24". Shell and lining are 100% nylon, trim is 100% polyester. Black in color with white stripes. Good for the spring time. In good condition. Windproof and Waterproof. OutDry waterproof breathable, fully seam-sealed protection; external seam tape. Droptail hem extends coverage in back. Rear Collar Seam to Bottom Hem 26". Pit to Pit Laid Flat 19". 100% NYLON. Light purple color-block softshell. Great condition & very cute. See pictures for details. Length - 26". Don't know if it will fit?. Has zipped inside fleece lined jacket with gray nylon outer shell (see pictures 7 - 10). Red and gray~~~Four zipper pockets on the front~~~Made from nylon and polyester~~~No hood~~~Velcro at the end of the sleeves~~~Machine wash. Jacket in good, preowned condition, will have signs of wear consistent with gentle preowned use. Material is light weight, 100% nylon. Full Zipper Vest. Nice vest has pockets inside & two front pockets. If there are any defects I will be certain to disclose them to you. I will work with you to make certain you are compensated. Large ~ 21.5" Arm Pit To Arm Pit (43" Bust) ~ 16.5" Across Shoulders ~ 28.5" Length ~ 26" Sleeve. Review details and pictures carefully. Color : Nocturnal Blue. US SIZE SMALL = CHEST 33”-35” WAIST 27”-28”. US SIZE X-SMALL = CHEST 30”-32.5” WAIST 24”-26”. 100% Authentic! US SIZE LARGE = CHEST 38”-40” WAIST 32”-34”. US SIZE X-LARGE = CHEST 41”-43” WAIST 35”-37”. Women's COLUMBIA Hood Rain Jacket 207 RL3070 Poly Nylon Blue LARGE. Condition is Pre-owned. Shipped with USPS Priority Mail. The item features 2 zip pockets and wrist velcro! Get a great item for a bargain! We are dedicated to quality service and we make no exceptions! Here's a great 3-in-1 style coat from Columbia. Collar to bottom 27". Doing that is against U.S. and international laws. Lighting may change the color slightly based on photography lights, natural lighting, flash, or viewing on different screens or monitors. Length (shoulder to bottom hem): 24. Size Large. Waist: 20"Length: 27". Chest: 24".